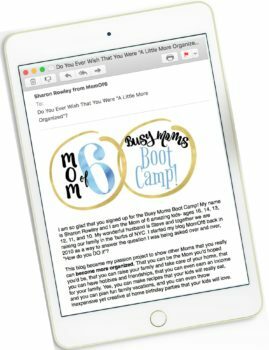 Family routines for yourself and for your kids that outline the steps of what you need to do and the order in which you need to do them in order to get through a particular part of the day make our lives SO much easier and really help our families to get organized! Here's how to get your day started the right way- with tips on how to create a morning routine for kids and for yourself! 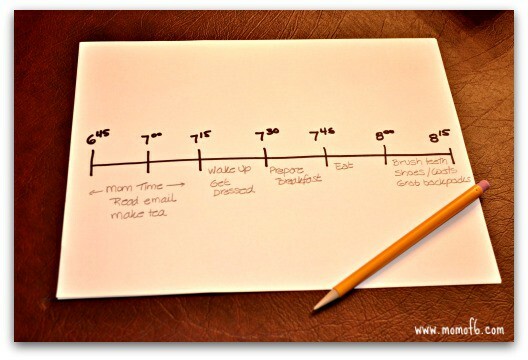 A Morning Routine for Kids Starts with a Timeline! 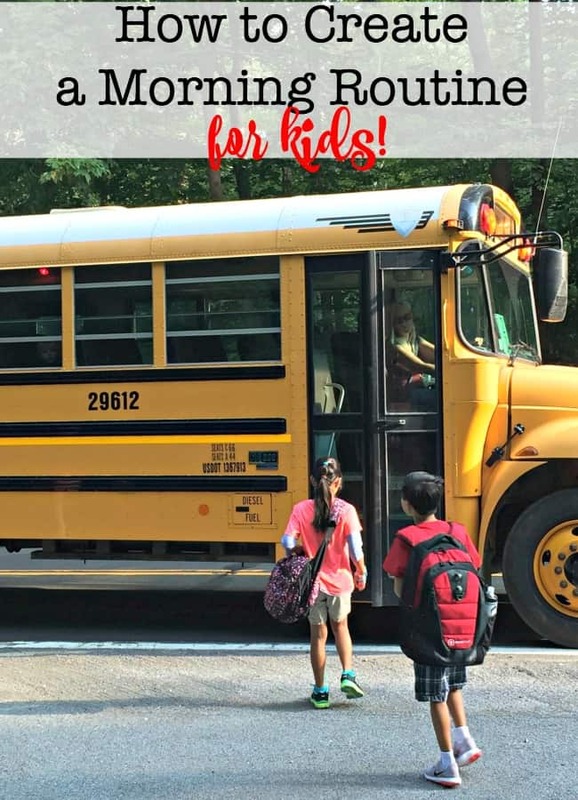 The most important thing about creating a morning routine for kids is to understand the timing of all of the things that need to get done in order to get the kids out the door to meet the bus on time. So get a piece of paper and draw a timeline- ending with the time you need to leave your home, and work backward in 15-minute increments. Start listing the activities that you need to accomplish, again working backward: get coats on, grab backpacks, brush teeth, comb hair, eat breakfast, prepare breakfast, get out of bed and get dressed. 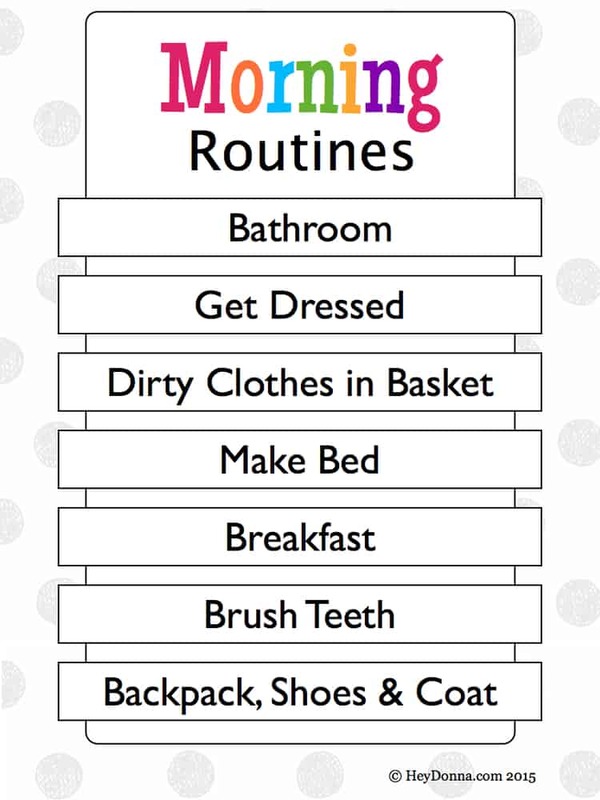 These are all things that the kids need to do every morning, and when I write them on my timeline and assign a length of time to complete each activity, I can see that if I start the process by waking them up at 7:15 am, that we can make it out the door by 8:15 am without rushing. Plan Time for Yourself Too! I think it's important that I give myself time in the morning to do a few things that are important to me. I like to have the dishes unloaded from the dishwasher so that I'm ready to start preparing breakfast. I like to prepare a cup of tea that I can sip throughout the morning. I like to check in on my e-mail early in the morning to make sure that there isn't anything urgent that I need to prioritize. I need to allow myself time to do all of these things, otherwise, I end up trying to multitask while also getting the kids ready. And trying to multitask in the morning when I am tired and the kids are sleepy too, just amps up the overall stress level in our home. I find it so much better if I can accomplish a few things that I would like to do first. When you are trying to get your kids to create a new habit, it helps to post a checklist in a place where they can see it and learn the new steps from it. For younger kids, it can be a picture checklist showing them all the things that they need to do and the order in which they need to do them in order to leave for school on time. For older kids, a simple list of activities like this one from Hey Donna would work perfectly! 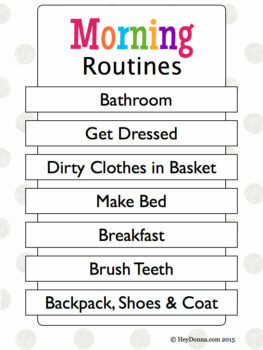 How to Create A Morning Routine for Kids…. in Action! 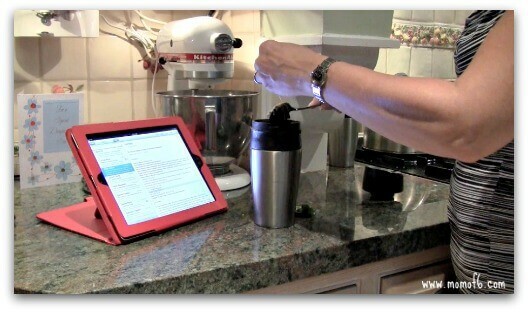 How is your morning routine working for you this school year? I would love to hear about it! I used to have a routine but now it kind of slipped off and I work away from home so I do not get to prepare my child for school and its heart breaking. But in in the evening I have something going but my problem is failing to keep time.Thanks for the help though. I will try. I live in Botswana I wanted they momsagenda diary but it is a expensive for me. Thanks. Will but something user friendly down here but I believe that would have been a good way to start 2015. This is what my office-day routine looks like. It’s now stuck in the bathroom and kitchen. I have been browsing online more than 4 hours today, yet I never found any interesting article like yours. It’s pretty worth enough for me. In my opinion, if all web owners and bloggers made good content as you did, the internet will be much more useful than ever before. I’ve figured out 3 different routines for workdays (from home) and office workdays, and days off (at home, but not lazying around!). I’ll let you know how it goes. That’s awesome Jessica! I definitely want to hear how it works for you! It worked fine, but now I’ve changed routine since I’ve been laid off. It gets better and better, your encouragement is a precious help!